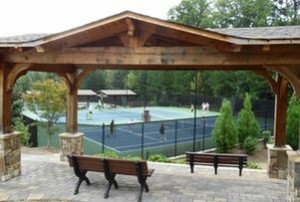 From leagues and lessons to junior camps and clinics, Smoke Rise offers the finest tennis amenities and programs in the area. Our members are proud of our facility and program, which in 2012 was honored by the Georgia Professional Tennis Association as best in the state winning the Georgia Peach Award. The Georgia Peach Award honors the best overall tennis facility and recognizes the facility for its achievement as the most cutting-edge and well-run tennis program in Georgia while maintaining high standards of appearance, cleanliness, and service offered with day-to-day operations. Smoke Rise Country Club boasts eight lighted tennis courts. Four state of the art har tru clay courts with stadium seating. The other four courts are composite hard courts surfaced in the USTA recommended color combination of Blue and Green; two of the four hard courts have the permanent 10 & under lines. All of the courts have their own gate, for convenient entrance and exit. There is no concern for player hydration as every court has easy access to a water station inside the court playing surface. Viewing area for every court is covered so spectators can enjoy the matches without being in the hot southern sun. The Smoke Rise Tennis Center has a full pro shop with professional stringing services, state of the art ball machine available for rental, the latest equipment, men’s and women’s tennis attire, private lockers, showers and a café available for food and beverage with a big screen television. Our busy tennis programs offer professional training programs for men, women and children. Smoke Rise signature tennis event is the charity tennis pro-am which includes the best tennis professionals in the south. In addition to the pro-am, SRCC tennis boasts a full twelve-month calendar of events as the tennis program at SRCC is always in season. Ages 5-7: Wednesdays and Thursdays from 4-5pm and Saturdays from 9-10am. Ages 8-10: Wednesdays and Thursdays from 4-5:30pm and Saturdays from 10-11:30am. Ages 10 & Up: Wednesdays and Thursdays from 5:00-6:30pm and Saturdays from 10-11:30am.